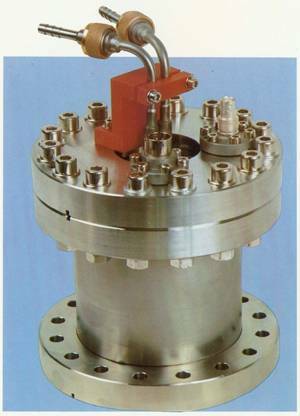 The beam stopper is provided to collect accelerated particles and can be mounted on the end of a beam line or on the down-stream flange of a standard diagnostics chamber, e.g. at the end of a beam or at the “straight-socket” of a magnetic chamber. The particles are stopped on a cooled disc of tantalum. In the event of charged particles, the collected charge represents the beam intensity (neutral particles can be monitored by observing the charge of secondaries). In front of the stopper disc, a segmented aperture allows sensitive beam centering and a rough measurement of beam position. A cylinder in front of the electrode system is provided for secondary particle suppression and can be supplied with an appropriate high voltage.